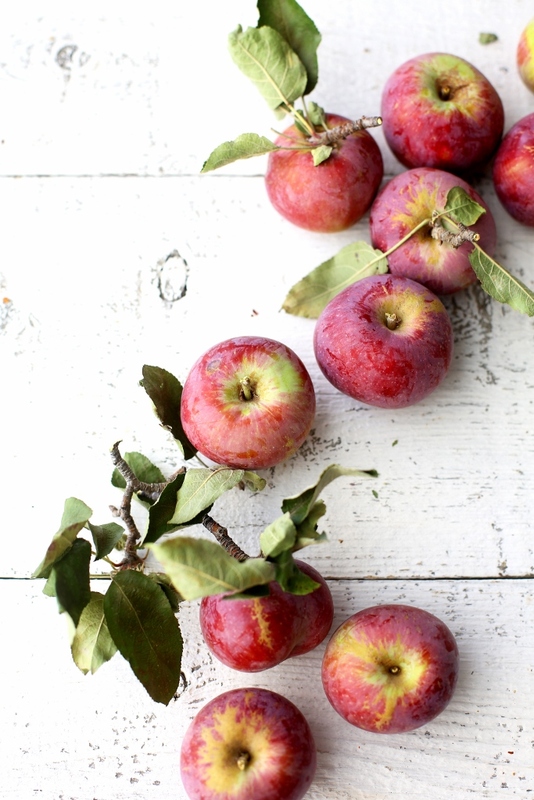 A few weeks ago we went apple picking in Julian and brought back a lot of apples for baking and juicing. There were enough apples for a few desserts! 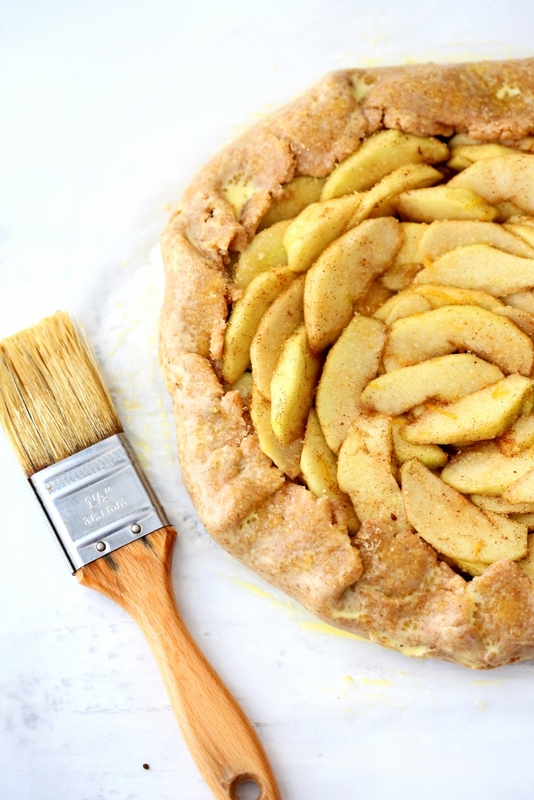 Right away we made our favorite Dutch apple pie as a way to ease into fall baking. Something easy, familiar, and comforting. That was polished off in a day. 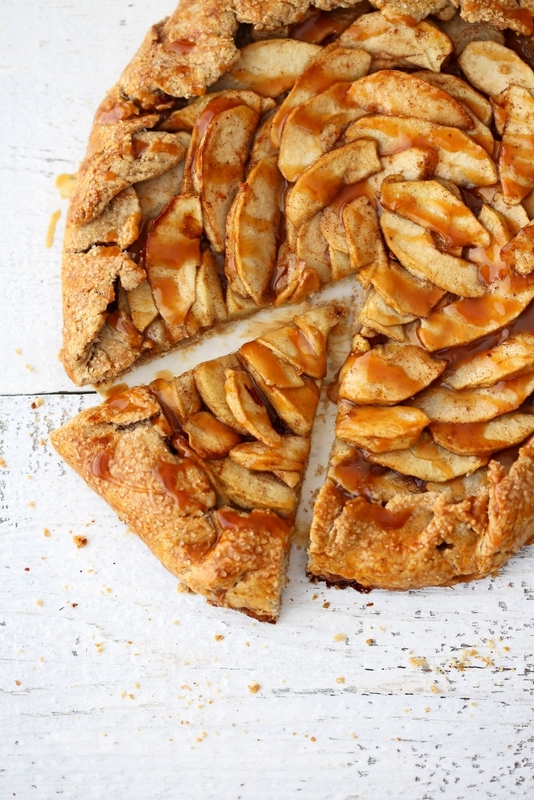 With so many apples left, I wanted to surprise Vu with another treat–salted caramel apple galette. Yes, salted caramel! I think I drooled a little just typing those words! I’m excited about this galette for many reasons. With a lot of practice from summer baking, I finally found the ratio of flour to butter that I’m happy with. The crust turned out perfectly crispy and flaky. The apples held up nicely in the cooking process and oozed of goodness. And the salted caramel sealed the deal! 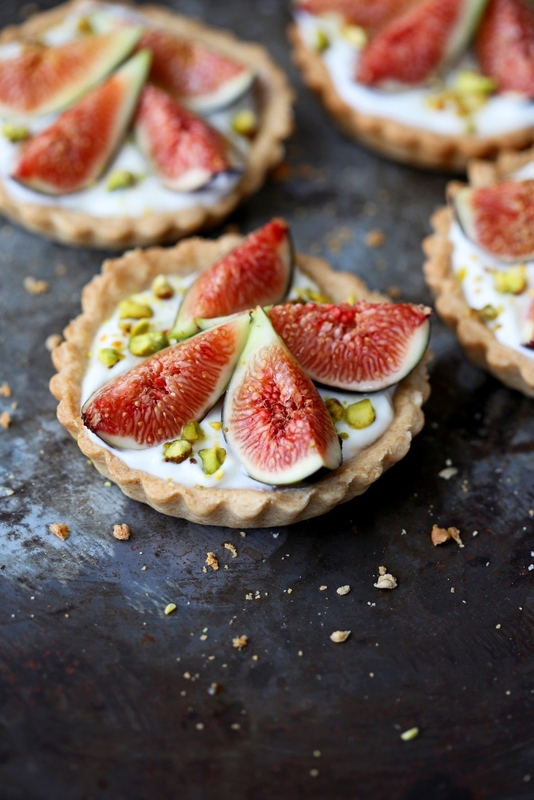 We’ve already made this tart twice and will definitely be making it again! 5. Peel, core, and slice the apples into ¼-inch slices. 6. In a bowl, add the apples, lemon zest, lemon juice, Calvados, sugar, cinnamon, and cornstarch. Toss with your hands to combine. Set aside. 7. Remove the dough from the fridge. Roll it out on a lightly floured surface to a circle of about 13 inches wide and ¼ inch thick. Move the dough onto a baking sheet lined with parchment paper. 8. Arrange the apples in the center of the dough leaving a one and a half inch border uncovered. 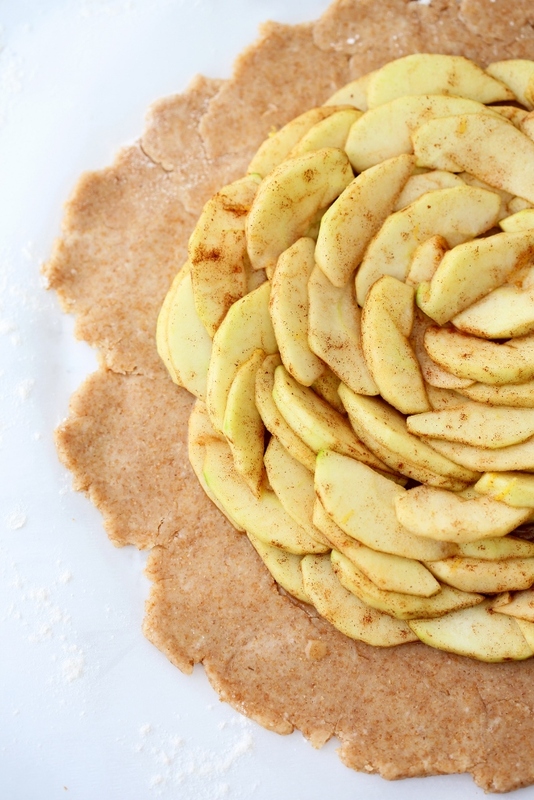 Fold the dough edges over the apples, pleating it loosely and leaving the galette open in the center. Patch the dough together if it breaks. Pour the juice from the apple mixture into the galette. 11. Remove the galette from the fridge and bake for 50-60 minutes until the pastry is golden brown and crusted with sugar, and apples softened. 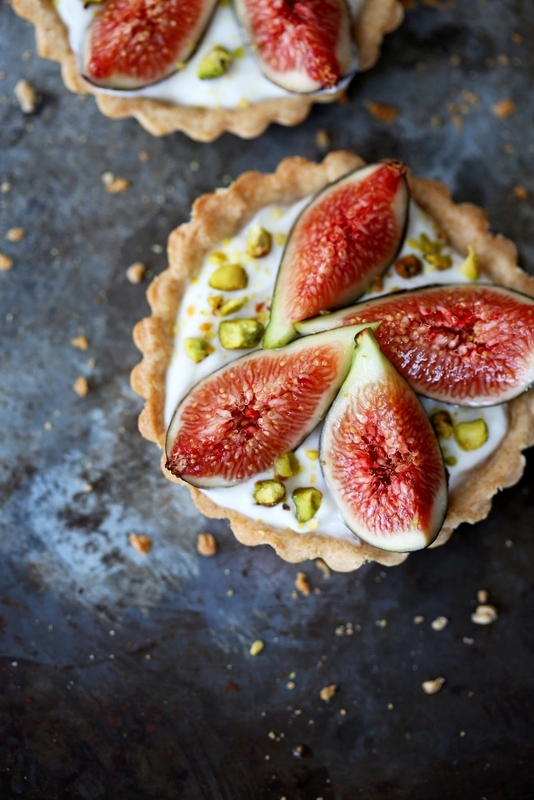 Remove the galette from the oven and let it cool on the baking sheet. 12. 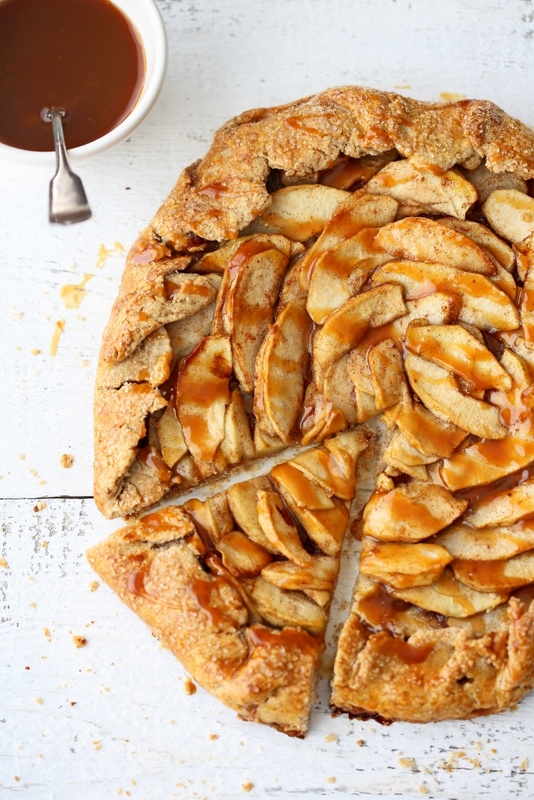 While the galette is baking, prepare the salted caramel sauce. 13. 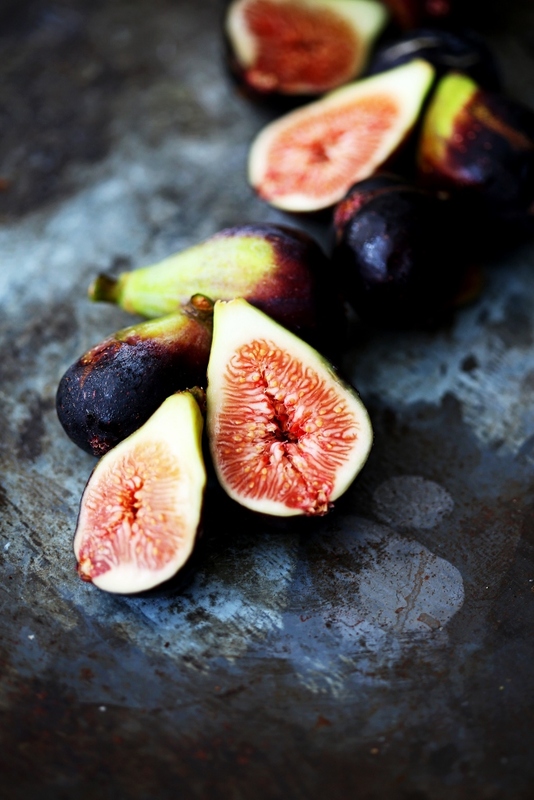 In a heavy saucepan, combine sugar and water and bring to a simmer over medium heat. 14. Once the sugar starts to melt, watch carefully as the sugar darkens, stirring gently to help it melt evenly. 15. When the caramel becomes a dark amber color, remove the pan from heat and immediately but slowly pour the cream into the saucepan. 16. The mixture will steam and bubble up so be careful not to burn yourself. When the bubbling subsides, gently whisk to completely blend the cream into the caramel. If you see lumps of hardened caramel, put the pan over low heat and stir until the caramel is melted. 17. Once the caramel is completely smooth, stir in the salt. Set aside and let the salted caramel cool. 18. 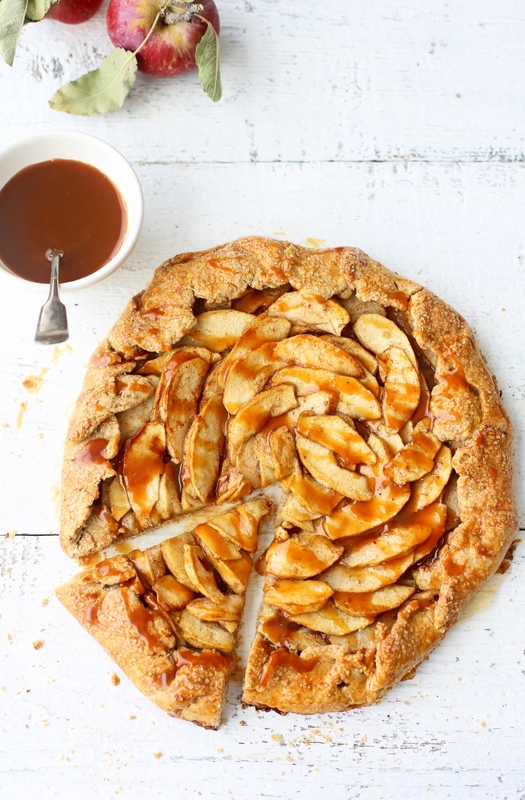 To serve, transfer the galette to a serving plate, cut into wedges, and drizzle with salted caramel sauce.